Facial recognition, guns which fire only when the target is in sight, and unmanned submarines. A look into the future of Israeli defense. It is an open secret that the defense establishment is constantly working behind the scenes to develop new technologies for the battlefields of the future. "This is no longer the tank we knew in the past," said Brigadier General (res.) Dr. Danny Gold, Administration for the Development of Weapons and Technological Infrastructure (MAFAT) at the Defense Ministry. "We work today with many new technologies which are also being developed in the civilian market. If we can have a driverless car, then we can develop an unmanned tank which will meet all of our operational needs virtually without any danger to human life. We can also [develop] an unmanned submarine which can travel farther distances, all without putting anyone in danger," said Dr. Gold, known as the "father of the Iron Dome" missile defense system. MAFAT has 25 departments and employs about 500 IDF officers and civilians. It has been awarded 14 Israeli security awards and 19 creative innovation awards. It has extensive overseas cooperation, as well as 41 national security centers in the defense industries, including 2,000 leading researchers, and 1,000 Talpiot graduates in parallel management of 1,500 projects. 185 foreign delegations visit MAFAT each year. It maintains 27 active program headquarters, and 47 of its officers received the technological commendation from the Chief of Staff. "It can be said that MAFAT is like a large venture capital fund which manages about 1,500 projects at any given time. The only difference is that a venture capital fund works to make money for investors. Our fund is designed to create security for the State of Israel and to develop technologies for the IDF," Dr. Gold said. He provided an example of the extent of the Defense Ministry's activity. "A few days ago, we conducted an evaluation process to learn and draw conclusions [from our research], which we called 'wrapping up the project.' We were approached many years ago with a proposal to invest in a certain module, the likes of which had never been developed in Israel. We were persuaded to invest a small initial amount of about $100,000 at first. "As time went on, development progressed and we invested more into the project. Today, that small technology has become an important radar component of the Iron Dome and David's Sling [missile defense systems]. The radar of the Barak-8 [air defense system], which was marketed globally and sold for billions of dollars, was based on the technology we invested in the project, when no one believed in it. There are countless similar examples." If the new technologies are too expensive to develop, MAFAT can sell it abroad, he said. Dr. Gold could not reveal specific details, but MAFAT enjoys broad cooperation with many friendly countries around the world. MAFAT has extensive cooperation with the US in the areas of missile defense and anti-tunnel technologies. It cooperates with many national projects in the US. Many of the best scientific minds in Israel participate in this cooperation. About 200 workers are employed in industries but work for the Defense Ministry in accordance with the multi-year work plan that MAFAT sets for them. "Any development that interests us and any investment candidate should go through a committee for selecting developers," Gold said. He explained that every issue, from a tiny investment of NIS 100,000 in academic research to the development of the Iron Dome system, is approved by committee. In some cases, the committee decides to approve the tender and in part approves a contract with a single supplier. In addition, Dr. Gold presents facial recognition technology on video, various types of drones, and Israeli satellites which Dr. Gold views with great pride. "The Israeli government will soon be launching a satellite once every few years. The pictures we received from the Ofek-11 satellite are the best we've ever received from a satellite." The APC of the future: the 'Carmel:' One of the current projects is a multi-year plan for developing the technological infrastructure of the armored vehicle, which will constitute a quantum leap in many areas. It will be light, small, agile, lethal, simple to operate, and relatively inexpensive. The first stage of the development plan is proof of the feasibility of only two soldiers operating the radar. Breakthrough technologies are being developed on a global scale as part of the project, including a hybrid engine. 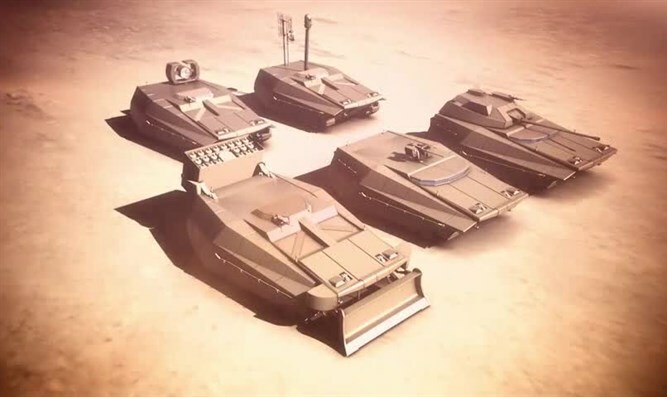 The Carmel is being developed by MAFAT together with the Merkava Project Administration and the Tank Program Administration (MANTAK) at the Defense Ministry, as well as leading defense industries. DUKE light-weight hovercraft: The system is being developed by an Israeli start-up company funded by the Defense Ministry. The project aims to use a drone to shoot snipers, creating a surprise on the battlefield and preventing IDF forces from walking into dangerous situations. The development stage had to overcome complex technological challenges, including the drone's ability to stabilize and stay airborne, remote fire accuracy, and operational safety. The system is in advanced stages of development and will be tested in the coming year. 'First-generation' SMASH: An electro-optical system applied to an assault rifle which dramatically improves the odds of accurate fire in all shooting situations and scenarios. The soldier holds the trigger but the rifle fires only when the target appears in the center of the sights. In experiments conducted to date, the use of the system significantly increased the percentage of hits on targets and reduced the impact on those who were not involved in hostilities. The system does not fire itself but merely blocks or allows fire, and is subject to the soldier's control. The system is expected to be used extensively by the infantry and ground forces. 'Green Oceanodroma': An unmanned helicopter designed to carry and transport heavy loads. The Defense Ministry held a competition to design a drone which could carry up to 150 liters (40 gallons) or 60 kilograms (132 pounds) a distance of eight kilometers (five miles) and back. A private company (the same company which developed the DUKE) produced an unmanned helicopter capable of reaching speeds of up to 150 kilometers per hour (93 mph), carrying a weight of up to 180 kg (400 lbs), capable of conducting long logistical missions thanks to its specially designed engine. Another aircraft introduced in the competition is an Aeronautics drone. The drone, which reaches a top speed of 75 kph (46 mph), uses an engine and batteries based on hybrid propulsion. It can carry up to 90 kg (200 lb), and is suitable for tactical missions involving low-altitude flight with dedicated cargo. MAFAT will consider how to continue developing and using the drone. A miniature unmanned submarine for reconnaissance and mapping missions, developed in Israel in cooperation with the Ben Gurion University of the Negev: The submarine is characterized by its ability to dive rapidly and almost vertically. It surpasses comparable submarines with its ability to float and move in any direction. The 'Kirson:' An autonomous submarine for secret missions. It is an unique unmanned vehicle in the world of intelligence operations, and is at the cutting edge of global technology. Large investments in the civilian vehicle market have brought significant developments in autonomous vehicle technologies. However, there is a fundamental difference between travel on normal roads and the kind of travel military vehicles must perform. Therefore, significant technological developments are necessary to allow military vehicles to maneuver in all conditions. This affects the safety and firepower of armored vehicles. Many technologies are already in development and are being perfected for operational use.